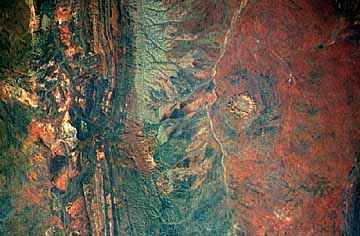 This is a Shuttle photograph of an old section (43 by 66 miles in size) of the MacDonnell mountain ranges in central Australia. This is really dry country, Mate! Look at the dry gulches cutting through the folded mountains on the left side of the image. And that's just sand and scrub brush on the plains at right. Can you find any craters? Image courtesy of NASA/Johnson Space Center. Space Shuttle photograph STS41D-41-028.